The koala is perhaps the best-loved of all Australia's marsupial, or pouched, mammals. Although it is rather bear-like in appearance, its nearest relatives are the opossums. The koala is known all over the world for its cute and cuddly bear-like looks, but these animals aren't really bears, they're marsupials and are related to the kangaroo. In January 2015 there were estimated to be 2,000 to 8,000 koalas in the wild. Among the problems that threaten them is habitat destruction. 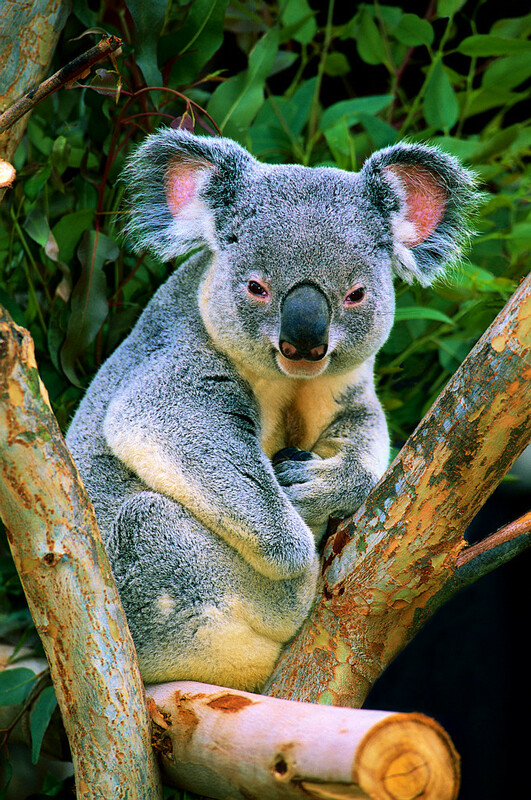 When it comes to habitats koalas are fussy customers as they only eat leaves from eucalyptus trees and so are only found in woodlands or forests that contain that yummy vegetation. Many trees and woodland areas are being cut down for new buildings, farmland, mining projects or roads leaving koalas and lots of other wildlife with a lack of suitable habitat, food, shelter and safety. Another threat is climate change. Increasing CO2 levels are known to affect the amount of nutrients found in the leaves of eucalyptus trees - the koalas' only food source. Climate change is also predicted to increase bush fires and droughts in Australia - conditions which aren't favourable to the tree dwelling and slow moving mammal. Other threats include road traffic and attacks from dogs. Will the koalas have a happy ending? Hopefully with the help of conservation projects and a better understanding of their habits and habitats locals, businesses and governments can help to keep koala numbers up. To find out more visit the Australian Koala Foundation and download this PDF by the IUCN about the species most likely to be affected by climate change.